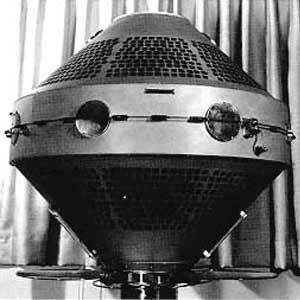 Explorer 8 or S-30 was a 41 kg mercury-battery-powered, earth-orbiting satellite designed to obtain measurements of the electron density, the electron temperature, the ion concentration, the ion mass, the micrometeorite distribution, and the micrometeorite mass in the ionosphere at altitudes between 400 and 1600 km. It was intended to study the temporal and spatial distribution of these properties and their variation from full sunlit conditions to full shadow, or nighttime, conditions. The payload was in the form of two truncated cones with the bases attached to a cylindrical equator. The outer shell was aluminum and had a diameter of 76 cm and a height of 76 cm. The 108.00 MHz transmitter had 100 mW average power, and it functioned for the life of the battery pack (54 days). The data system included telemetry consisting of continuous operation with real-time transmission. To avoid the possibility of effects on the experiments by asymmetrical charging on solar cell surfaces, solar cells were not used. Simultaneous measurements of electron and ion concentration were used to resolve the question of neutrality of the medium. Battery power failed on 27 December 1960. Considerable difficulty was encountered with decommutating the telemetered data to make machine processing possible. As a result of these difficulties, the data were mostly processed by hand. In spite of these difficulties, considerable new knowledge about the ionosphere was gained from operation of the satellite.